These options allow the user to decide whether information from the incoming job should replace or update any existing information or should be ignored altogether. Merge options are set in the Merge setup window. 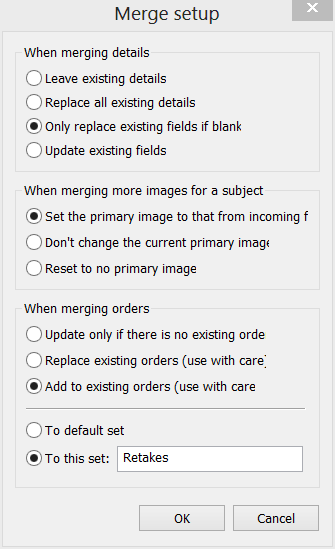 Options for merging data allow the user to decide whether existing data for a given subject is preserved, replaced or updated. When merging subjects with images, it is possible to decide how to handle the primary image. Reset to no primary image Images will be reset to no explicitly marked primary image. Care should be taken when merging orders to ensure orders in the open job are not inadvertently replaced.